Pensioners in Ondo State today, November 6, 2018 praised Governor Oluwarotimi Akeredolu, SAN, for always respecting them and listening to their views. The pensioners hailed the governor for humbly granting them audience to discuss the issue of their welfare . The pensioners, who were full of excitement during a meeting with Governor Akeredolu, recalled that the immediate past government ignored them for six years. Led by their Chairman, Chief Raphael Adetuwo, the pensioners hailed Governor Akeredolu’s interest to providing fund for this year’s Pensioners’ Day Celebration. According to them, the union itched to meet with the immediate past government for six years without success. They also hailed the governor for assisting the state pensioners union to put its vehicle on the road. 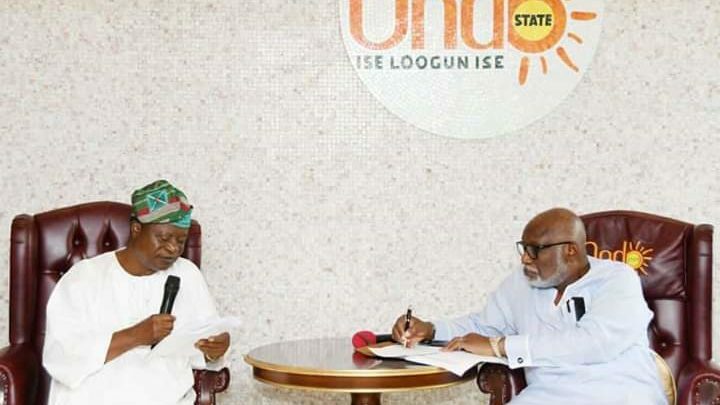 Governor Akeredolu, while responding, told the pensioners that his administration is poised to serve the people of the state, including the pensioners . He added that the people of the state deserved good infrastructure.